In this post I would like to share, a technique which has been well rewarded to me in the past, is the extraction of foreign exchange rates from web into my financial models on demand. This technique has been critical in some of my past projects for the reason of multi currency/country financial reporting. Many businesses now a days are not limited to their continent, they are spread across the world earning’s in multiple currencies thus bring a different set of challenges with itself for conversion complexities and reporting. The above Jedox spreadsheet downloads the data for the selected currency against USD for the user selected time frames and renders a chart out of it. 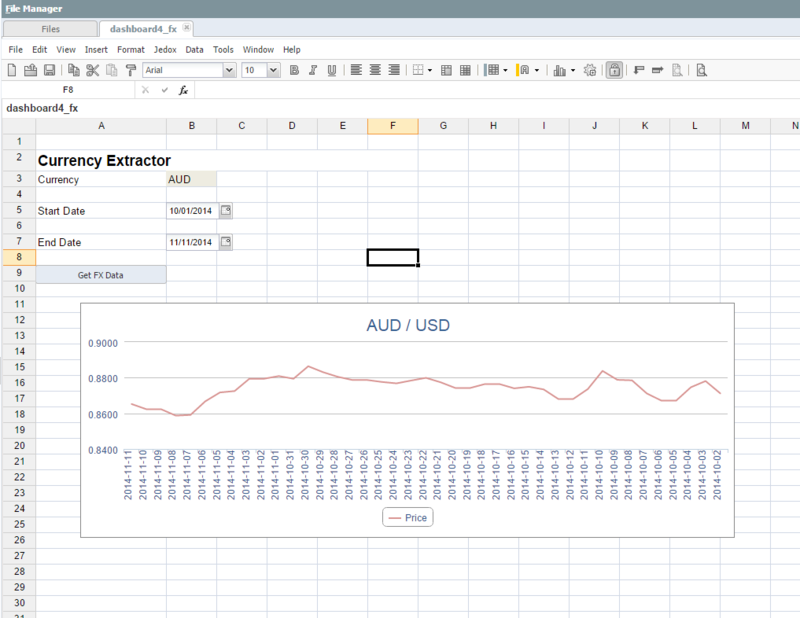 The above spreadsheet can be amended to download the latest data itself only, for accounting representation of into multiple currencies. This is a reference technique only for illustration purposes, which can be amened to incorporate multiple data sources providing data sets like historical stock prices, macro economic data, custom web extractions, and similar. But ensure that the source is reliable and established in terms of their reporting format so that your model/extraction code continues to work depending upon the source.